IT TOOK 50 YEARS FROM MY FIRST TRIP TO JAPAN TO DO IT, BUT I NOW HAVE AN OFURO AT HOME. 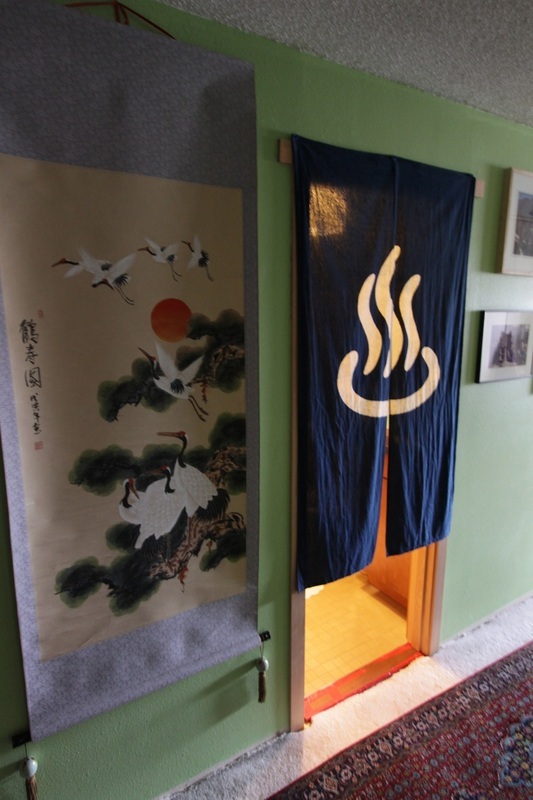 THE ENTRY FROM THE HALLWAY HAS A "NOREN" WITH THE TRADITIONAL SYMBOL FOR "HOT SPRING BATH" OR "PUBLIC BATH". 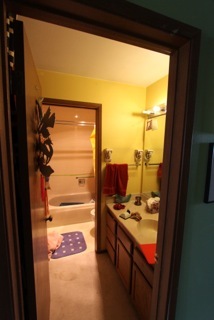 LOOKING IN THE DOOR, THE "DRY ROOM" HAS THE SINK AND TOILET, BEYOND IS THE "WET ROOM" WITH SHOWER ON LEFT AND SOAKING TUB ON RIGHT. 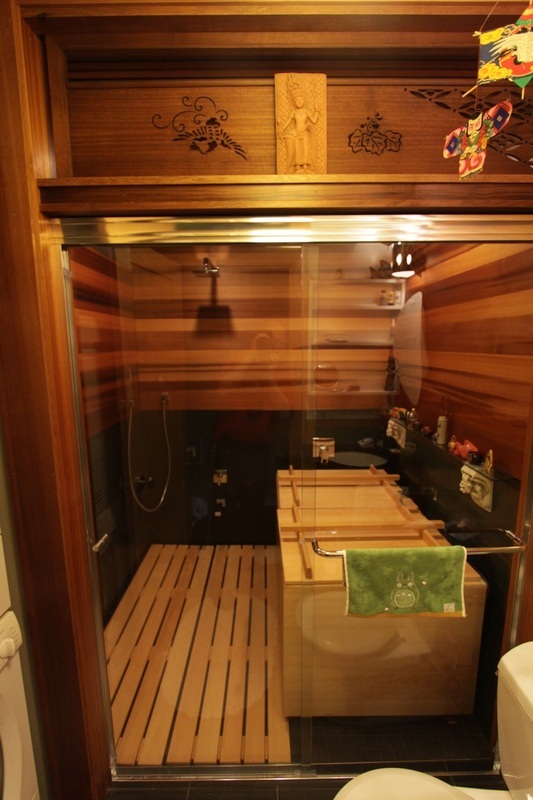 WHEN USING, THE "SUNOKO" DUCK BOARDS ARE LAID ON THE TILE, AND THE COVERS PLACED ON THE TUB WHILE FILLING WITH ¡HOT! WATER. MEANWHILE ONE WASHES WITH THE SHOWER OR, USING A STOOL (YET TO BE PURCHASED….) 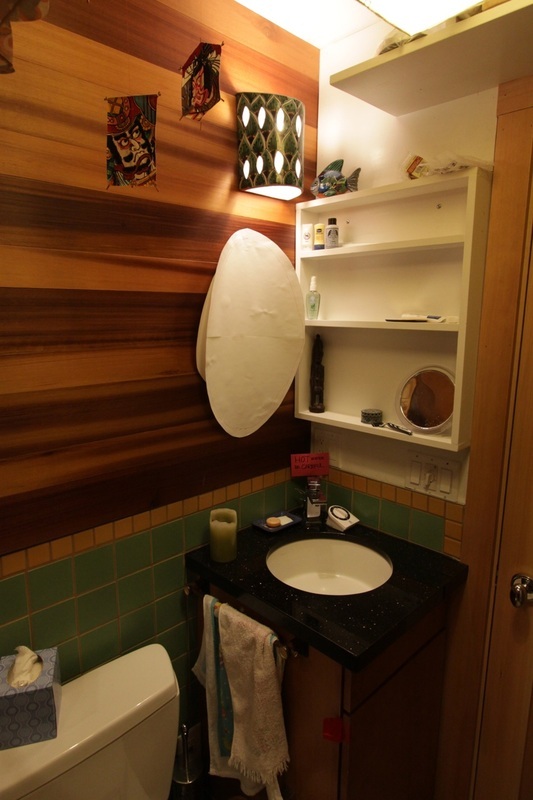 SIT AND USE A WASH BASIN. WE HAD TO MOVE THE WALL ON THE LEFT, SO WHEN REBUILT, I ADDED THE GLASS BLOCK FOR A WEE BIT OF NATURAL LIGHT FROM THE ADJACENT ROOM. 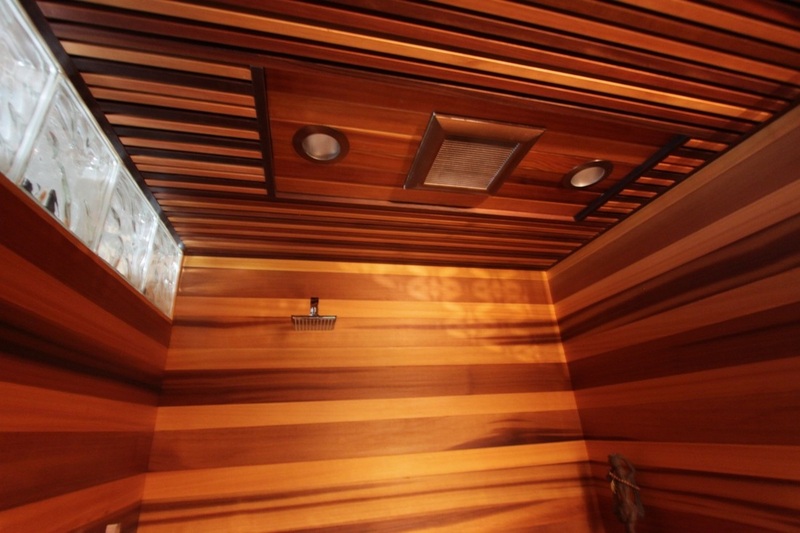 THE CEILING IS MADE OF 1 X 1 CEDAR PIECES ATTACHED TO PLYWOOD PANELS, WHICH ARE ATTACHED TO CEILING RAFTERS. 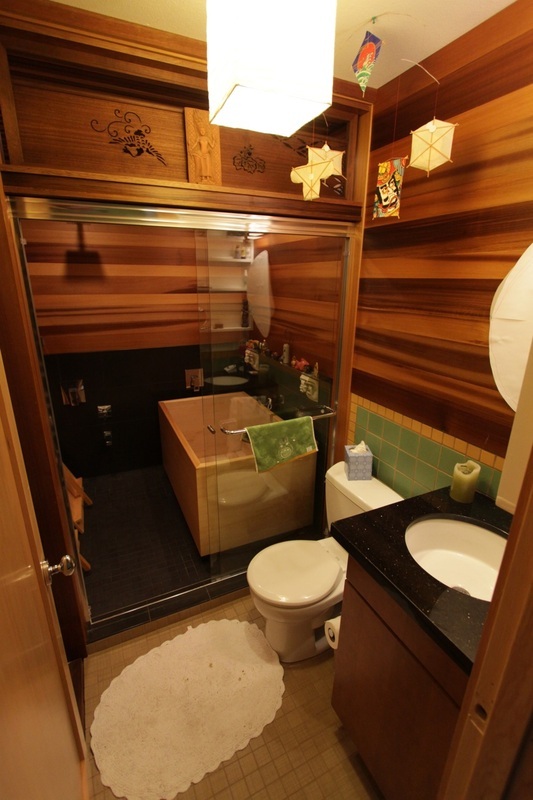 THE WALLS ARE CEDAR ABOVE, BLACK TILE BELOW. THE FLOOR SLOPES TO A TRENCH DRAIN ALONG THE WALL. 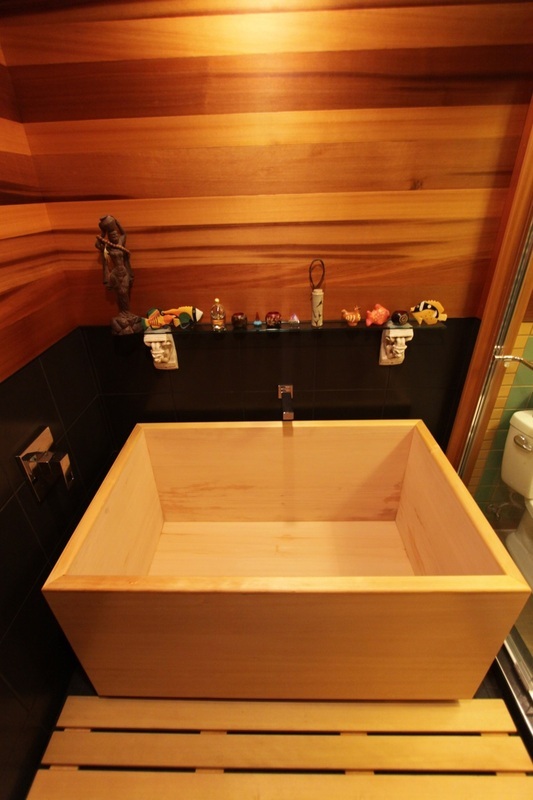 THE TUB WAS MADE IN ALASKA FROM "HINOKI", (JAPANESE CYPRESS), ALTHO, SINCE "HINOKI" IS QUITE DIFFICULT TO OBTAIN, IT IS PROBABLY MADE FROM PORT ORFORD CEDAR (WHICH IS NOT A CEDAR, BUT IS A CYPRESS RELATIVE TO "HINOKI"). 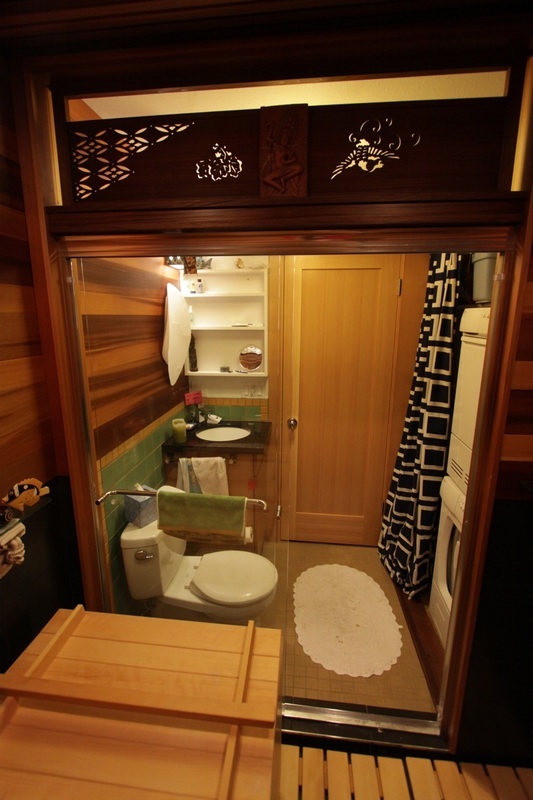 THE CARVED WOODEN PANEL ABOVE THE GLASS DOORS IS A "RANMA", USED BETWEEN ROOMS (THO NOT IN AN OFURO) IN JAPANESE HOUSES. WE FOUND IT AT A JAPANESE ANTIQUES STORE HERE. AS WE FIND ITEMS, LIKE THE KITE MOBIL, DECORATIONS ARE BEING ADDED. AS WE MAKE DECISIONS, LIKE WHAT SIZE AND SHAPE MIRROR TO HAVE, ORDERS ARE BEING PLACED. NOTE TIMER: TO REMIND US THE TUB HAS FILLED TO AN APPROPRIATE LEVEL (ABOUT HALF WAY FOR TWO BODIES; A LITTLE MORE FOR ONE).